If you want to impress your dinner guests and enjoy feeling a little special every time you sit down at the table, Wedgwood are the brand to turn to – and with a Wedgwood promotion code you can enjoy fantastic savings too! Whether you want to treat yourself to a classic set of tableware or splash out on a refined teapot for your afternoon tea, a Wedgwood discount code will save you money while you shop. Wedgwood started life way back in 1759 when Josiah Wedgwood set up as an independent potter in Staffordshire, England. Over the years he became Britain's most successful ceramics pioneer, transforming the industry into an international art form. Over the years, the brand has established prestigious connections with royal families and heads of state around the world, designing and manufacturing beautiful ceramic wares that have graced some of the finest tables for generations. Today, Wedgwood ceramics are manufactured at the Wedgwood factory in Barlaston, England, where the company has been based since the 1940s. At the factory, modern technology is combined with the timeless skills of throwing, modelling and decorating as first refined by the company's founder. They also carry on the tradition that has seen Wedgwood historically work with some of the leading art and design names of the era, with collections from Jasper Conran and Vera Wang. At Wedgwood they're committed to designing and manufacturing premium, desirable and distinctively English home and lifestyle products, exporting to customers all around the world. The Wedgwood online shop is a great place to browse and shop for a wide range of Wedgwood products, with everything available to search by category or designer. Want an exclusive set of tableware to bring out on special occasions? They've got a wide selection of sets and accessories in a choice of beautiful designs for you to choose from. Or perhaps you want to extend some Wedgwood style throughout your home? There's also a range of Wedgwood homeware for you to choose from, including vases, Christmas decorations, picture frames and much more. Decorating a nursery or a playroom for children? They even stock a gorgeous collections of products based around Beatrix Potter's original illustrations for her timeless Peter Rabbit books. Want to get shopping with Wedgwood? With a Wedgwood promotion code you can enjoy fantastic savings on their wide range of ceramics, homeware and more. So whether you're looking to develop a refined look for your home or you want a really special present for a loved one, Wedgwood vouchers will help you save the pennies. Wide selection of prestige tableware, tea sets, homeware and more. Browse our website until you find a Wedgwood discount code that suits you, then navigate to their website to begin shopping. When you're finished shopping, click 'Go to bag/checkout'. Enter your Wedgwood promotion code in the box provided and click 'Apply promotion'. If you've enjoyed shopping with Wedgwood, you might also like to check out more great deals on homeware and more at stores like Homebase and Argos. Or, if those aren't right for you, you'll find plenty more deals to browse in our Home and Garden section. Select 'Checkout as guest' and click 'Continue'. Enter your payment details and click 'Proceed to order review' to complete your purchase. Standard UK delivery is free on all orders over £75. For orders below £75, a delivery charge of £4.50 applies. If you need to return a product for any reason to Wedgwood, you can do so by simply returning your items in their original condition within 30 days of receipt. Need to speak to the team at Wedgwood? 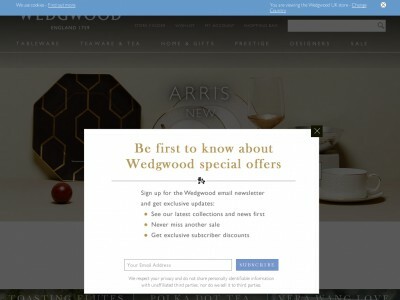 Whether you have a question about your order, want some expert advice on choosing the right pieces for your home or just want to find out more about how you could make big savings with a Wedgwood voucher code, you can contact the Customer Services department by accessing the online help centre here. Want to find out more about exquisite heritage homeware with Wedgwood? The company maintains a profile across all your favourite social media networks. Follow them for access to lots of exclusive content including new collections previews, competitions, design inspiration and more. You can also use these pages to find out more about saving money with Wedgwood coupons. Don’t forget to check them regularly, as you can never be sure when a free Wedgwood discount code might be waiting for you! Buy now online at www.wedgwood.co.uk. My mother-in-law has always admired Wedgwood ceramics, but never dreamed she could have some herself. Then I discovered a Wedgwood promotion code online. With a Wedgwood discount code you can enjoy amazing savings on a wide selection of prestigious tableware at wedgwood.co.uk. I used my Wedgwood vouchers to get a great deal on a beautiful set of plates and cups to surprise her on her birthday – and get her what she needed.